LaBry Family Dentistry is happy to provide high quality dentistry for the communities of Broussard, Youngsville, St. Martinville, Lafayette, New Iberia, and beyond. We’re happy to see each member of the family and address their unique needs. We’ve got you covered, whether your newest addition needs their first cleaning, your sports playing teenager needs a customized mouthguard, or your grandparent needs a denture stabilized. Habits that are formed in childhood can be exceedingly difficult to break. This is why we believe in laying down the foundation of good oral hygiene right from the beginning. Our goal is to make a child’s dental appointments fun and interesting instead of intimidating. When the little ones visit, we use terminology they can understand, and our gentle care makes their experiences positive and memorable. 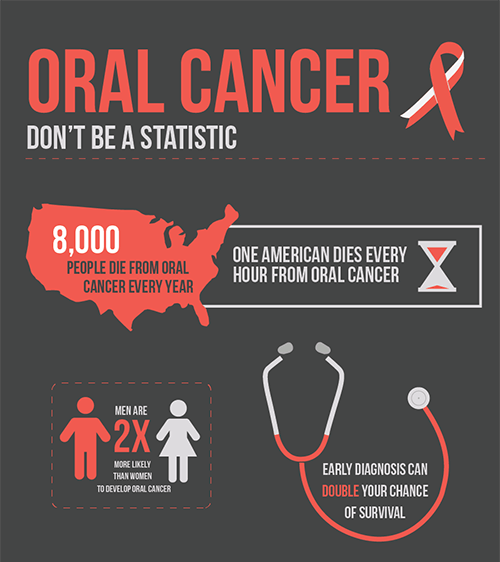 Cigarette smoking – Smoking increases the risk of oral cancer by 6 times. While your experiences will vary based on the dental practices you visit, one thing remains the same: our line of questioning. We know it can make patients feel anxious to be put on the spot about how often they’re flossing and brushing, but these questions aren’t asked from a place of critical judgment. It simply helps us emphasize that good oral hygiene is our best line of defense against dental health problems, and our care will be personalized according to each person’s needs. We’re here to help patients feel confident about the health and appearance of their smiles, and the importance of a solid home care routine can’t be overstated. Regular visits with Dr. LaBry and our thorough hygiene team will ensure your mouth is in top condition. Brush at least twice a day. While the prevailing opinion is that it’s best to brush after you eat, it’s actually recommended you brush before eating to avoid enamel damage caused by acidity. We recommend using an electric toothbrush, and don’t forget to reach all the way to the back of your mouth and brush your tongue! Floss daily. Floss before brushing to remove plaque between teeth that your toothbrush can miss. Rinse with mouthwash after brushing. This step kills more germs and bacteria, helps prevent gum disease, and freshens your breath. Rinse with water after eating and drinking. In between brushing, this can help reduce plaque and decay by minimizing the time sugar and acid have contact with your teeth. Eat a healthy, balanced diet. We know this isn’t always easy, but it’s definitely for the best. Minimizing our consumption of sugar and highly acidic foods and beverages can help us keep our mouths and bodies in peak performance. You’ve more than likely heard the words “gum disease” as often as you’ve heard the word “cavity,” and it makes sense because of their closeness in regard to how much of the U.S. population experiences both. About 78% of Americans have had at least one cavity by the age of 17, and 80% of our population has some form of gum disease (also referred to as periodontal disease). These symptoms are detrimental enough on their own, but gum disease is also linked to 52 potentially life-threatening diseases, such as heart disease, diabetes, arthritis, Alzheimer’s, and GERD. Our mission is not to scare you with this information, but to once again stress the importance of diligent oral hygiene routines. Gum disease is treatable, but even better than treatment is prevention. If you’re experiencing any of the symptoms mentioned, the compassionate care of Dr. LaBry and his dental team can help you get your oral health back on track. Call us or schedule an appointment. Bleeding gums – Contrary to popular belief, this is not normal. It could result from brushing too hard, but if you’re using a soft-bristled brush and using the proper technique, you shouldn’t experience bleeding. Bad breath – A build-up of plaque creates the perfect living conditions for bacteria that produce odor. Redness or swelling of the gums – This is inflammation, and a sign of worsening gum disease. Receding gums – The roots of your teeth may become exposed due to gum tissue moving away from your enamel (the hard, mineralized surface of your teeth). Sensitivity – Exposed tooth roots can cause sensitivity to hot and cold foods and beverages. Abscess – This is the result of bacteria within a periodontal pocket, which causes swelling, pain, and pus. Loose teeth – Left untreated, periodontal disease results in bone loss, and your teeth can become loose or migrate. This process is accelerated by excessive biting forces from teeth grinding or clenching. The days of having a cavity filled with unsightly metals are gone. The dark fillings of the past were made from silver amalgam (a mix of metals, including toxic mercury). Besides being potentially toxic, metal fillings also tend to expand and contract with changing temperatures, which leads to cracks and separation that leave room for decay to enter – kind of defeats the purpose of a filling, right? Thanks to advancements in the world of dentistry, we now use a composite resin that is stable, non-toxic, and blends in with your natural smile. If you have a cavity in need of filling, Dr. LaBry can help restore your smile and prevent future decay with tooth colored fillings. Did you know that mouthguards can reduce your risk of sports-related dental injury by 60 times? This statistic alone is why some sports teams require their usage when playing. Dr. LaBry can provide Broussard patients with custom fabricated mouthguards for the highest levels of comfort and protection. Mouthguards also provide protection from nighttime teeth grinding, clenching, and bruxism that can cause headaches and TMJ issues. You may not even be aware of this happening while you sleep, but common symptoms include frequent headaches, migraines, or pain in your face, jaw, or neck. Your relief from these symptoms could be one appointment away. If you are experiencing uncontrollable bleeding, dizziness, loss of consciousness or memory, or severe head or ear pain, please go to an emergency room immediately. If a tooth has been moved or loosened, you’ll need treatment within six hours. For a tooth that has been chipped, we may be able to reattach pieces if you can bring them with you. Pick the tooth up by the crown (the part that is usually visible). Gently rinse with water (do not scrub or remove tissue fragments). If it’s possible to put the tooth back into its place, be sure it’s facing the right way. If you can’t replant it, place it in a cup of milk or water with a pinch of salt. Call us immediately at: (337) 385-3250. If you’re suffering from acute or persistent tooth pain, this is usually an indication of tooth decay. We strongly suggest you don’t try to ignore the pain, as a bacterial infection can spread through your tooth and into your gum tissue, which can then push it into your bloodstream. Tooth pain can also be caused by loose fillings or sensitivities. LaBry Family Dental can help solve each of these problems. You don’t have to suffer – call us today!